These policies have resulted in mixed outcomes. The challenges that hamper implementation of inclusive education span across attitudes and lack of training, resources and administrative framework. National legislation and policies in several other countries have also emphasized the need for inclusion and mainstreaming. - Placement options under non-formal education like National Institute of Open Schooling (NIOS) and distant learning through Indira Gandhi National Open University (IGNOU) are also practical approaches to education..
- Home based education where the child is enrolled in a school but is unable to attend on a daily basis due to multiple reasons such as mobility /self help related disabilities. In a few developed countries, families choose to educate the child at home but this is not so common in India. Inclusive education is primarily about restructuring school culture, policy and practice so that it responds to the diversity of students in the locality. It sees individual differences not as problems to be fixed, but as opportunities to enrich learning and embrace change. Inclusive education is a dynamic and continuing process of facilitating the participation of all students, including those with disabilities. This process involves work at various levels including that of classroom teachers to modify teaching-learning strategies to teach children with disabilities. The Government of India launched a number of programmes such as Operation Blackboard but most of them focus mainly on infrastructure, education of girls, SC/ST students. Some programmes like Integrated Education for Disabled Children and the District Primary Education Programme focused on promoting education were also launched with limited success. Education has been the joint responsibility of the Centre and the states. The former provides policy frameworks and budgetary support while the State and Union Territories organise, structure and implement their own policies. India signed the UN Convention on the Rights of Persons with Disability on 30th March, 2007, the day it opened for signature. India subsequently ratified the Convention on October 1, 2007 and has committed to providing equal educational opportunities to all persons including children with disabilities. As per Article 24 of the Convention, Government has already initiated a number of steps to amend legislation regarding Rights of Persons With Disability to harmonize it with provisions of UNCRPD. A new department of Disability Affairs has been created in the Ministry of Social Justice & Empowerment to focus on the policy issues and problems of persons with disabilities. The department will also help in strengthening the existing schemes, formulating new schemes and also introducing technological innovations. However, execution poses the real challenge. The sad reality remains that children with disabilities are still being rejected by many schools. The Sarva Shiksha Abhiyan, a flagship programme of the Ministry of Human Resource Development has set a goal of providing 8 years of elementary schooling for all children including children with disabilities in the age group of 6-14 years. The Sarva Shiksha Abhiyan framework also provides for zero rejection. The programme is making good progress and covers nearly 195 million children in over 1.2 million schools in the country. Out of these, nearly 60% schools are now barrier free. The component of inclusive education in Sarva Shiksha Abhiyan is still lower than planned. The issue of access to education and lack of other infrastructural and financial resources for children with disabilities in rural areas remain to be addressed. Children with disability in the age group of 4-14 years are provided free education under the Integrated Education for Disabled Children Scheme. A large number of NGOs in India are working on disability issues and are perceived by the Government as widening the implementation framework and also bringing greater flexibility and innovation in the educational programmes including promotion of inclusive education. In addition to Government schools, some private schools have also been voluntarily implementing inclusive education but these are mainly in urban areas. National Trust also provides substantial support and scholarships for education of persons with disabilities. The philosophy of Inclusive Education rests on giving equal opportunities and full participation to an integrated group of persons with and without disability studying together regardless of any difficulties or differences they may have. - To bring out the best in the child, without alienating him/ her. - To provide the child with a warm and enriched environment. - To assist the child in developing basic skills to cope with day to day challenges. - To develop skills that will enable the child to become self-reliant. - To help the child develop a desirable attitude towards society. Teacher training and school leadership are essential components for successful implementation of inclusive education in the classroom. There is a need to include a paper on disability in training programmes for teachers. This is necessary to help teachers to be sensitive to the specific needs of children with Disabilities and empower them to identify and deal with disability. This will include provision of effective educational services, assistive devices, support services, age-appropriate classes, barrier free environment, availability of neighbourhood school and involvement, vocational training, sports and cultural activities should be made a part of school curriculum. For meaningful inclusion of children with disabilities, all teachers shall be oriented to deal with such children with disability, in a classroom situation. - Monitoring to assess the quantitative and qualitative progress in inclusive education, creating barrier-free school buildings. Although government is the primary stakeholder, a number of NGOs and private institutions are playing a major role in the promotion of inclusive education. 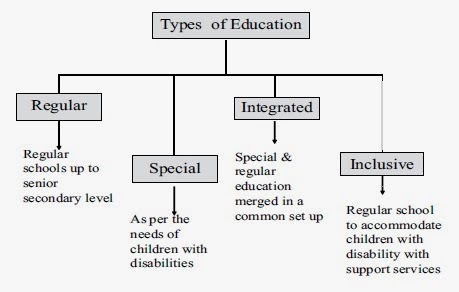 There are several institutions in India who have successfully implemented integrated as well as inclusive education. Amar Jyoti is the pioneering institution promoting inclusive education since the day of its inception in 1981. With the ratio of almost 50:50 of the disabled and the non disabled, the school has been aiming at inculcating a better understanding of disability, while instituting confidence among children with impairments. The school in Delhi has a mix of 450 and in Gwalior 250 students. There are four sections with a total of seventy students with hearing and speech impairment. Initially hearing impaired students are given training in lip reading and sign language. Training in total communication makes their entry in regular sections easier. Some girls are good in dance and sports. Most of these students have been found to be good in drawing and painting. About eight visually impaired students have been fully integrated in regular classes. Eleven are still in a special section where they are receiving training in Braille and mobility. Through special software they are being trained in computers also. There are eight sections for over one hundred intellectually challenged students. One section has been earmarked for children with multiple disabilities also. The orthopedically challenged are given assistive devices and sent to regular classes. In fact after initial training and social integration the regular class become inclusive of the able and the disabled studying together. Children learn to play before they learn to read or write. Cultural activities and sports have a special role in developing children into young adults. Through these activities children develop intellectually, socially, emotionally and physically. Young children are natural explorers; they are never still, and seldom silent. They learn by trial and error as they play together. A child with a disability is no exception. The events have to be planned in a manner that the able and the disabled can play together. In cultural activities also we experience that inclusion helps inculcating confidence and highlights their abilities. The institution has adopted a holistic approach to education, medical care, rehabilitation and vocational training. The team of special educators, parents, counsellors, therapists, social workers and doctors play a significant role in implementing inclusion. They can be either on the roll of the institution or visiting faculty. Each one of them ensures implementation of components of inclusion. The rather slow speed of spread of inclusive education despite a zero rejection policy is due to a number of difficulties. While there is no shortage of issues and constraints in the interpretation and implementation of inclusive education in the country, a more pragmatic view needs to be taken both by the Centre and the States. This journey has not been easy but it demonstrates that it is possible to provide holistic rehabilitative services to children with disabilities not only to include them in mainstream society but also to enable them to enjoy a life of equality and dignity. - Need proper transport and enabling environment for children with special needs. - Involvement of parents as learners, teachers, decision makers and advocates. - Providing interactive & fun filled classrooms. - Development of flexible curriculum to reduce academic load. - Removal of gender and other social biases. Develop appropriate teaching and learning material. - Establish linkage between preschool and primary education. - Provision of adequate resource. Action for Ability Development & Inclusion (AADI), New Delhi; Akshay Pratishthan, New Delhi ; Tamanna, New Delhi ; Bhartiya Vidya Bhavan, New Delhi ; Laxman Public School, New Delhi ; Blind People’s Association, Ahmedabad; Indian Institute of Cerebral Palsy, Kolkota; Spastic Society of Manipur, Manipur ; Vidya Sagar, Chennai; National Centre for Inclusion, Mumbai; Digdarshika Institute of Rehabilitation & Research, Bhopal; Drishtidan, Guwahati and many more. Because of constraint of space, the list given above is not comprehensive but only indicative. - Students learn to appreciate each other’s unique strengths and abilities. - Students are encouraged to help each other. - Students with disabilities are able to foster friendships in a natural, supportive, and encouraging environment. - Non-disabled students get a chance to develop positive attitudes towards people with differences. - Self-esteem and a feeling of achievement surfaces automatically. - Students imbibe desirable social behaviour best from each other. The sensitive and secular policies of the Government have helped to create an infrastructure and attitude in the country to address the needs of persons with disabilities. There is a paradigm shift from charity to empowerment and from the medical model to the psycho-social models. The Government is committed to provide equal rights to persons with disabilities for education, inclusion and empowerment. A separate Department of Disability Affairs has recently been created in the Ministry of Social Justice & Empowerment to specifically empower Persons with Disabilities. There is also a need to promote academic discussions for assessing the impact of different approaches in the present inclusive set up. The initial years may prove trying since difficulties & problems will arise & progress may be slow & gradual. It is important to maintain self belief & faith in one’s capabilities. The strength of an inclusive set up is a dedicated and committed management and its team. This expansion of facilities can be undertaken in phases preferably by starting with one or two types of disabilities depending on the number of such children with disabilities living in the neighbourhood, ensuring involvement of parents, provision of assistive devices and providing special concessions and reforms in examination systems. Inclusion and mainstreaming should guide all decisions and policies dealing with persons with disabilities. While planning for inclusion in education the learning should be an integral part of the team of stakeholders, special attention should be paid to ensure retention of children with disabilities in school. The desirability and need of designating a single Ministry as the responsible implementation agency for inclusive education should be expeditiously examined. This would ensure the success of implementation of the 86th Constitutional amendment in 2002 to make elementary education for all children and implementation of the Sarva Shiksha Abiyan. In short, the way forward lies in adopting a multi-pronged approach comprising teamwork amongst policy makers and stakeholders, ensuring comprehensive services for inclusion, providing retention in schools, allowing assistive devices like talking calculators, talking pens and other concessions in examinations and reforms in the examination system, training of trainers, strengthening legislation and providing sufficient resources. Implementing all these, the inclusive education, though difficult, will become possible. Dr Uma Tuli The author is Founder & Managing Secretary, Amar Jyoti Charitable Trust and Former Chief Commissioner for Persons Disabilities Delhi.